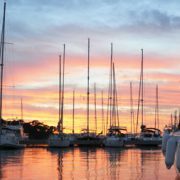 You are here: Home / Ask-the-Mermaid / Tips / Is there an easy way to remove barnacles? So, you want to do some exercises that will guarantee more upper body toning? 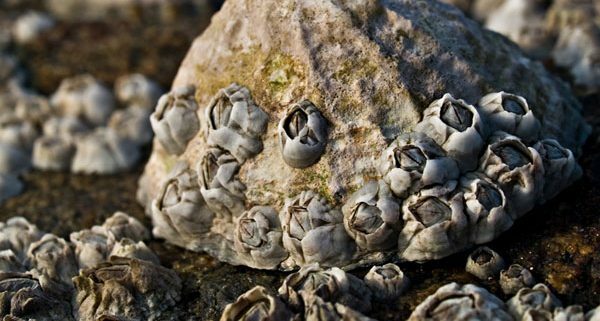 Well, you’re going to get your wish, if you don’t take early steps — right away — to prevent the growth of barnacles. Is there an easy way to remove barnacles? The short answer is “no.” Just listen to a brief description of these shell-fouling organisms as described in an Interlux coatings information sheet: Shell-fouling microscopic organisms are hatched in the sea. They swim around until they find a nice neighborhood (your boat bottom) to attach themselves to. 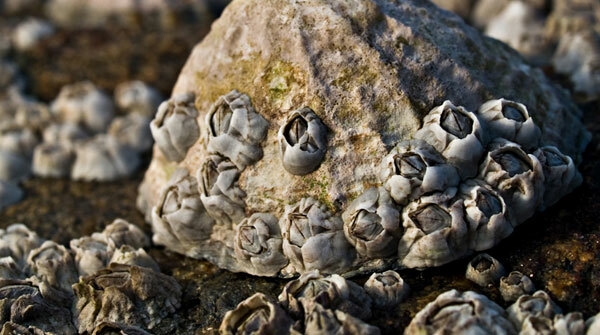 The most common shell-fouling organism is the Acorn Barnacle. There are a variety of species that can grow to a whopping 7 centimeters in diameter. When barnacles adhere to the bottom of a boat, they continually grow and exert considerable pressure at the point of attachment. These creatures enjoy their resting place so much that even when removed, they leave a strong foundation, commonly called “husks.” The adhesion of the husks is so great that the force necessary to remove them can tear the gelcoat, causing more damage. After visiting with Tom Ringold of Seaview Boatyard in Seattle, in hope of discovering some new secret solution to the barnacle problem, I’m sorry to report he didn’t have any “sweat free” techniques to pass along. Nonetheless, here is Ringold’s “upper body toning” process for barnacle removal that should be of help to you. 1. Remove the shells using a commercial pressure washer. 2. Use a long-handled floor scraper to remove as much of the barnacle as possible. 3. Use a paint scraper to remove the husks (this is the hard part). 4. 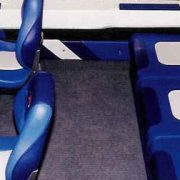 Clean the remaining residue with cleanser and lime remover, making sure the hull is thoroughly cleaned up to the boot stripe. 5. Lightly sand and apply two coats of antifouling bottom paint. Ringold said Seaview does not use sandpaper to remove the husks, because the necessary pressure would also remove too much fiberglass, leaving a hollow called a “dish out.” You get more control using the paint scraper. Ringold introduced me to Tom Gun, a boat owner in the process of doing his own barnacle removal. Gun was working on his 1910 Lawray 90-footer, using his tender, an 18 foot Grady-White. The Grady-White had no antifouling paint on its bottom and was in the water for eight months, playing host to a new colony of barnacles. Seaview pressure-washed the hull (charging $1.50 per foot). Gun set to work scraping what was left of the husks (approximately 45 minutes worth of labor), cleaned and lightly sanded the hull with 80 grit sandpaper, and was almost through with the first coat of antifouling paint (Interlux AL 200) when we met. He estimated that the job would be completed by the end of the day. https://www.mermaid.com/wp-content/uploads/2012/06/barnacle2.jpg 335 600 Boat Cleaning https://www.mermaid.com/wp-content/uploads/2012/07/mermaid-cleaning-logo21.png Boat Cleaning2012-06-08 19:20:482012-06-09 07:48:15Is there an easy way to remove barnacles? Get Ready For Spring Stop Bugging Me!